Homes decorated in the Tuscan decorating style are inspired by the elements of nature. Crumbling stone walls, intricately wrought iron accessories, sun-washed hillsides, rustic stone farmhouses, marble flooring and sturdy hardwood furniture are just some of the wonderful elements of this decorating style. Because almost anyone can visualize himself in such a peaceful setting, it's no wonder that Tuscan style decorating is so popular for today's homes. The appeal lies in its simplicity. By combining comfortable, worn, loved pieces, a room becomes warm and inviting. There's no attempt at pretense here. From ancient Roman times, people moved to the beautiful hills of central Italy to remove themselves from city life, escape the intrigue of politics, and embrace the idealized culture of the country. They enjoyed the beauty of nature and incorporated the elements into their villas. These same elements are what makes Tuscan style decorating so appealing for our homes today. From the exterior, the traditional Tuscan home is built of sandstone or limestone, using the natural materials found in this area of Italy which are available in a wide range of hues. Terracotta roof tiles can be seen everywhere in Tuscany. Marble, which is also found in abundance near Tuscany is used for decorative interior details such as flooring, arches, and pillars. In the interior, using sturdy materials that stand the test of time, the look of Tuscan style decorating is rustic, warm, and inviting. Nothing should look shiny and new. Deep-set windows framed by sandstone are often protected with rustic wooden shutters. Outdoor spaces are critically important, and a home incorporating Tuscan style decorating must include a patio, loggia, or portico. Walls built of sandstone bricks frame today's home, where in ancient times they served as a defense. Water is a critical element in Tuscan style decorating, and many homes have a water fountain in the central courtyard surrounded by beautiful, wildly growing greenery. Marble statues grace outdoor spaces. Tall, graceful cypress trees sway in the breeze. Walkways, driveways, and garden paths are set with stone or brick. Nature takes its course and grass grows up between the stones. How charming! The outdoors is brought into a home decorated in the Tuscan style. Woods, stone, and color are important elements. Natural stone walls are left natural. Stuccoed walls are colored with Venetian plaster, color washing or faux painting techniques to give a worn, well-loved look. True old Tuscan style rooms can have low ceilings and can be small and dark. But today's Tuscan rooms use wooden beams, plastered ceilings, and can have an open, airy feeling. Windows are left uncovered to take advantage of natural light. Wooden surfaces such as cupboards, door and window frames, shutters or ceiling beams are often left with a natural patina. Colors in Tuscan style decorating come from the earth. Terracotta, brick, ochre, greens, and golden yellow are seen everywhere. Blue and green are added to contribute a visually cooling effect in areas with hot weather. Surfaces that have been painted add a dash of color even when the finish wears off. Often walls are painted with a soft white or gray, while accent colors and natural woods and stone provide the interest. Ceilings have dark open timbers. Venetian plaster is a technique for adding texture and color to new walls. Homes incorporating a Tuscan style decor often use flooring of wide wood planks, timber boards, rough stone, unevenly-colored terracotta bricks, or clay tiles. Antique rugs add warmth and color. The furniture in a Tuscan style home is usually of straight, simple lines made from rough-sawn local woods. Accents of tile, wrought iron, and marble are common. To achieve the worn look, new pieces of dark woods or pine are often "distressed" at the factory. Open cupboards and armoires are found in almost any room and are used for dishes, linens, and clothes. Door fronts are often left open with chicken wire. No Tuscan style kitchen is complete without a long, family-style wooden table. Open shelves and free-standing cupboards provide storage in a Tuscan style kitchen and a place to display ceramics and pottery. A kitchen sink is made of natural stone or porcelain. Cabinet and sink hardware are often of dark wrought iron. Install a copper range hood surrounded by tumbled marble tiles at the stove area. Display copper pots from a wrought iron rack, use terracotta containers as accents and storage and add color with majolica dinnerware. Incorporate Tuscan themes in accent touch in your kitchen with displays of pasta in glass jars, a braid of onions or garlic, jars of olives, and flowers. 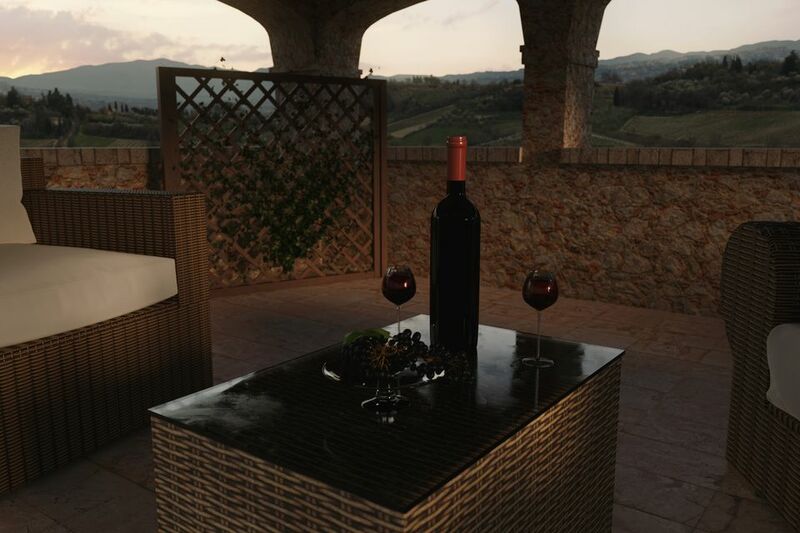 The natural elements of stone, wood, water, and color are essential in any Tuscan style home. By using all of the elements, you're sure to achieve this look that feels warm and welcoming.